Finally, Outreach Materials for Women and Girls in STEM to Show "You Can Do It!" If we ever want to increase the percentage of women in STEM, we need female role models women and girls can identify with. 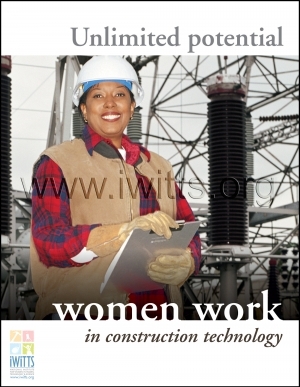 Prospective students need to see that there are women just like them thriving in these jobs. We believe that every school and district in the country should have the resources to build this vision. So, we've created the STEM Success Classroom Toolkit. 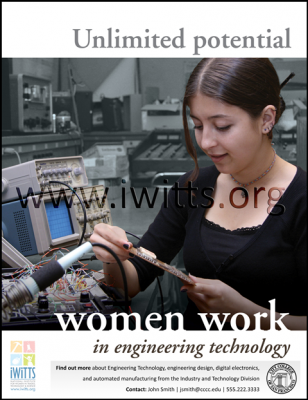 Note: The watermark (www.iwitts.org) will not appear on the actual banner. 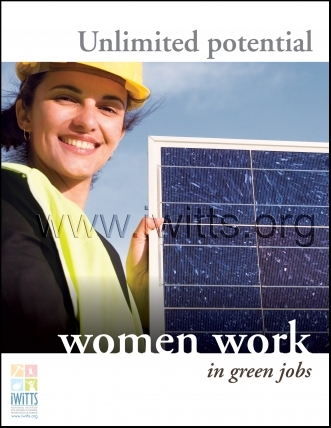 Send the message that women can succeed in these career areas! Each banner is 6 feet wide by 2 feet high and includes 3 grommets on top and bottom for easy hanging. Note: The watermark (www.iwitts.org) will not appear on the actual poster. Add your school's program contact information and logo to each poster. We'll include custom-sized labels and an easy-to-use template so that you can customize your posters add vital information about your programs! Click on image to see full-sized poster example with customized label. We've made it easy for educators to find online role model resources that will help women and girls see themselves in all career pathways. 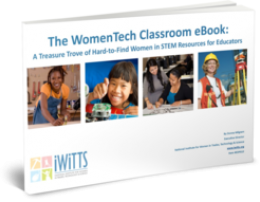 This downloadable guide includes links to sample curriculums and websites that teach STEM in a female-friendly way. We've done all the hard work for you. This will save you HOURS of research. 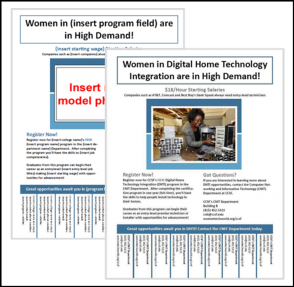 templates for Women in STEM program brochures, flyers, recruitment presentations, and school website sections that all include female role models. The female role model questionnaire has all the proven questions to ask your female role models. The BONUS Master Class includes downloadable transcripts and audio of twelve, 1-hour sessions that dive into proven, real-world strategies, and case studies. We usually sell this interview series for $180 per user license, but it is yours - FREE - when you purchase the Toolkit. 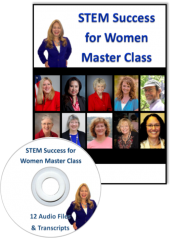 You'll learn how to move the needle for women in STEM...from experts and practitioners who have actually done it! "For a long time, we heard from educators, 'Well, we can't find any girls who WANT to be welders' - but now, there's an increased perception that supporting female students in male-dominated careers is a much bigger deal, and there are resources available that can give all students a better ability to explore and pursue their interests. IWITTS materials like the STEM bibliography and Outreach Kit are a huge part of the resources we can offer to districts to help them serve their students. It's not just about Perkins compliance anymore." If you're ordering from the state of CA, please contact us regarding sales tax on posters and banners. Which Size STEM Success Classroom Toolkit Is Right For Your Needs? Every school, district, region, consortia and state is different. That’s why we’ve created three distinct packages so you can choose the one that’s the best fit for your needs and budget. *Included shipping is for one location per order. Additional shipping locations may incur added shipping charges. Contact Us for details. If you're not sure exactly which package is right for you, or need more details or a custom option, we can help.